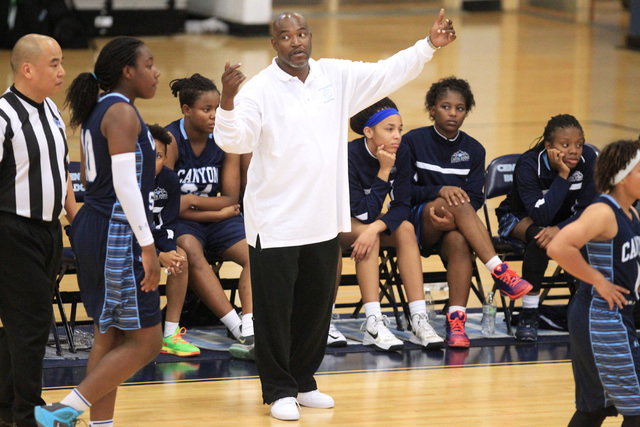 Canyon Springs’ girls basketball team would have done just about anything to shave the last three minutes off of its second game Saturday. The Pioneers, without their starting point guard due to illness and a starting forward after a fourth-quarter injury, had two-time defending state champion Reno on the ropes. But the Huskies finished strong, scoring the final 10 points to edge Canyon Springs 48-44 in the Las Vegas Holiday Classic at Centennial. The Pioneers, who beat Bonita (Calif.), 38-11 earlier in the day, raced to a 17-6 first-quarter lead, scoring eight points in transition. 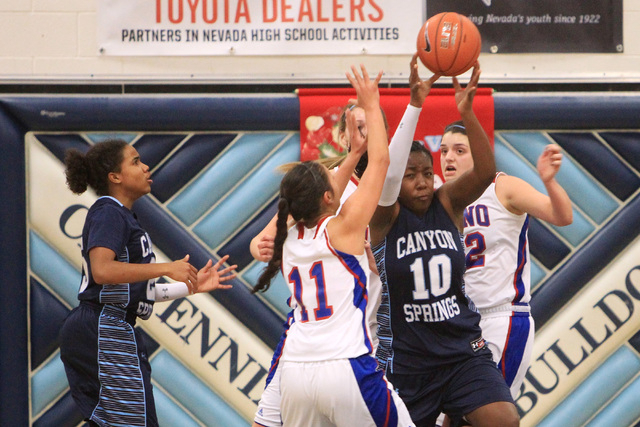 Canyon Springs tried to run as much as possible to stay out of a half-court game and away from reigning state player of the year Mallory McGwire, a 6-foot-4-inch post. For a little more than three quarters, it mostly worked. Daijhan Cooks’ transition basket off a backcourt turnover gave Canyon Springs a 41-29 lead with 6:54 remaining. The Pioneers’ tank was nearing empty, though. Senior point guard LaKiya Yarber did not dress for either game due to injury, and Cooks went down with an apparent left knee injury with four minutes to play. Consecutive second-chance baskets by McGwire, who finished with 21 points and 20 rebounds, pulled Reno within 41-33 and ignited a game-ending 19-3 run. McGwire had 10 points and nine rebounds in the fourth quarter after being held reasonably in check for most of the game by Canyon Springs 6-foot freshman Dre’una Edwards. Canyon Springs’ only points during the run was a three-point play by Alexia Thrower with 3:46 left, giving the Pioneers a 44-38 lead. McGwire made three straight baskets, the third a stick-back of a missed 3-pointer, to tie the game with 2:18 to go. 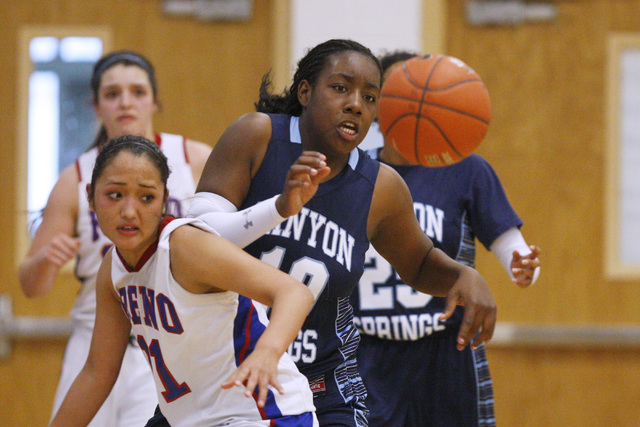 Then Daranda Hinkey’s steal and layup with 1:04 left gave Reno only its second lead. The Pioneers missed a 3-pointer with 25 seconds to play, and Reno’s Mikayla Shults made a layup with 19 seconds left to close the scoring. 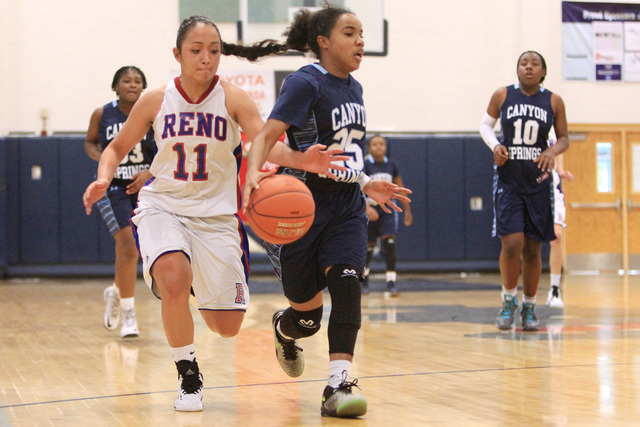 Thrower had 14 points, and Edwards added nine points and 18 rebounds for Canyon Springs, which made 19 of 73 shots from the field but forced 23 Reno turnovers. 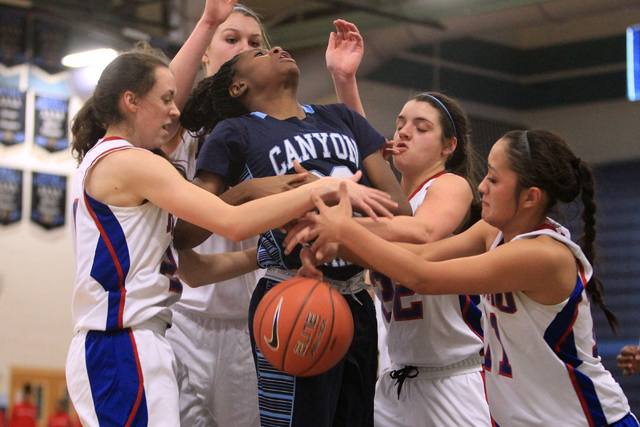 Canyon Springs 38, Bonita (Calif.) 11 — Edwards had 10 points as the Pioneers stifled the Bearcats. 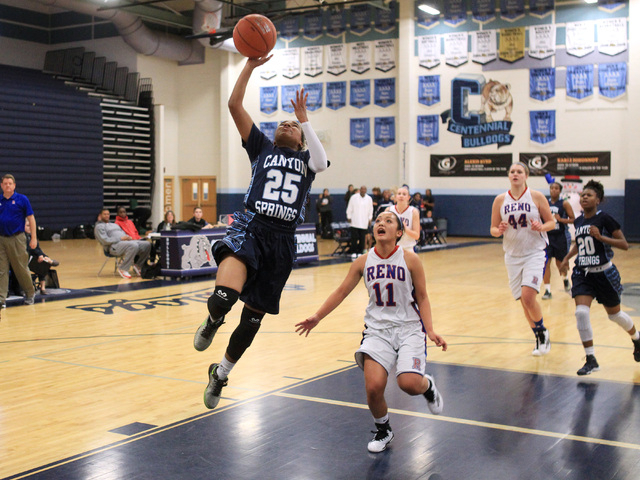 Thrower added eight points for Canyon Springs, which led 24-4 at the half. Briyanna Coleman had all three field goals for Bonita and finished with six points. Liberty 67, Palo Verde 21 — Kealy Brown had 13 points, and the Patriots scored the first 32 points of the game in a rout of the Panthers. Kaily Kaimikaua added 10 points for Liberty, which held a 47-2 lead three minutes into the second quarter. Marcie Goldberg led Palo Verde with nine points. Troy (Calif.) 58, Palo Verde 17 — Rebecca Lazuka had 14 points, and the Warriors bolted to a 34-8 halftime lead on their way to a win over the Panthers. Alyssa Siqueiros led Palo Verde with five points. Liberty 55, Culver City (Calif.) 43 — Brown and Paris Strawther each had 14 points, and the Patriots grabbed a 16-1 first-quarter lead on their way to a win. Kate Suyetsugu had 13 points, and teammate Katie Lin scored 12 for Culver City. 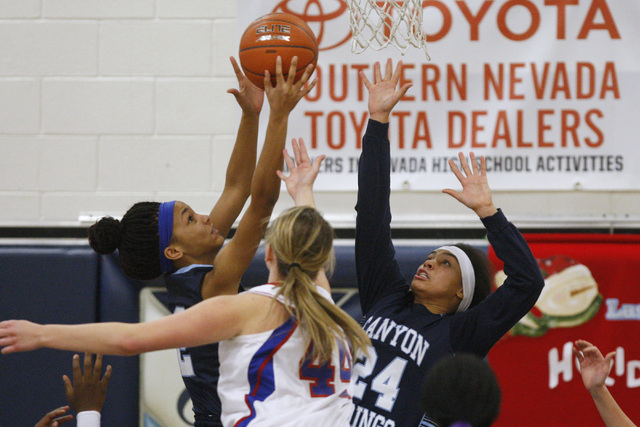 Quest Academy 67, Valley 21 — Brianna Osorio had 25 points to lead the Knights by the Vikings. Jenise McKnight had 18 points, and Kaylee Puckett scored 14 for Quest Academy. Kate Bordenave and Juleanna Tella each had five points for Valley. West Torrance (Calif.) 60, Quest Academy 41 — Jasmine Jones had 14 points to lead the Warriors by the Knights. Kayla Soto added 11 points for West Torrance. Osorio had 19 points for Quest. Schurr (Calif.) 55, Valley 25 — Argenis Valdovinos led a balanced offense with nine points as the Spartans downed the Vikings. Bordenave had 11 points for Valley. Centennial 64, Desert Pines 19 — Scotteanna Thomas led a balanced attack with 11 points as the Bulldogs routed the Jaguars. 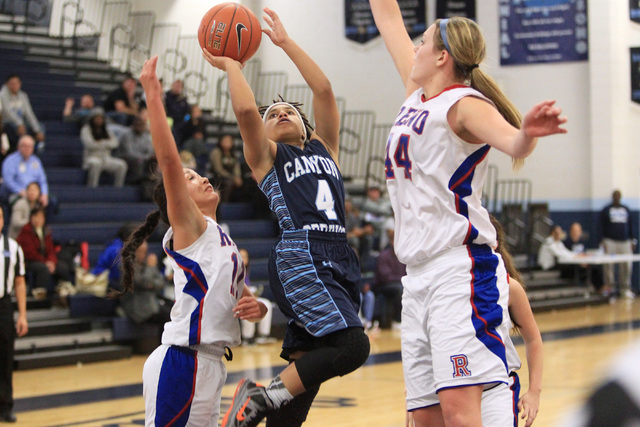 Jayden Eggleston added 10 points for Centennial, which had 13 players score. Cassandra Bueno had 10 points for Desert Pines. Centennial 62, Palos Verdes (Calif.) 32 — Eggleston scored 12 points, and the Bulldogs began the game on a 23-0 run en route to a win over the Sea Kings. 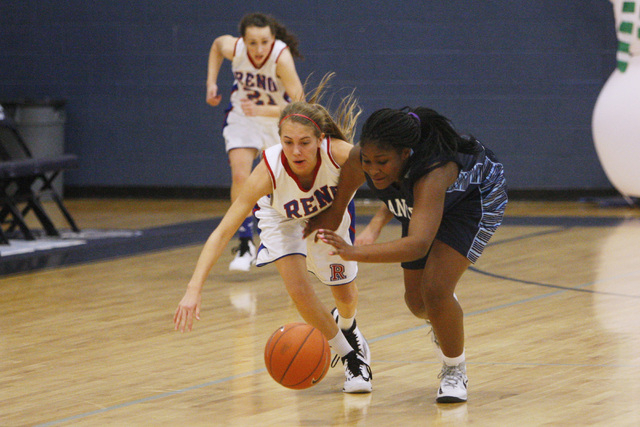 Pam Willmore scored 11 points for Centennial. Jillian Hrboka had 12 points for Palos Verdes. Palos Verdes (Calif.) 38, Desert Pines 35 — Anna Der had 15 points to help the Sea Kings hold off the Jaguars. Karla Sunjara added 12 points for Palos Verdes, which led 30-19 after three quarters. Chrystian Myles and Jordan Bailey each had 10 points for Desert Pines.